Wine tastings in Georgia is something that makes any visit to this country even more memorable. We suggest you discover Georgia by taking this 6-day tour, with a special focus on traditional winemaking. Family-run wineries and amazingly beautiful vineyards that spread across the Alazani valley – are the major highlight of this tour. Apart from that this wine tour program includes a traditional Georgian home visit, with home-made wine and home-made lunch to fully experience famous Georgian hospitality. Additionally, the Tbilisi city tour is not just a standard sightseeing program, but also a wine route around Georgian capital. Meet and greet at the airport, transfer to the Hotel (check-in after 2:00 pm). You will have a free evening for rest and settling. Overnight in a Hotel. After breakfast, at 10 am your local guide will be waiting for you to start a tour around Tbilisi. The tour will start from the monument to King Vakhtang Gorgasali, founder of the Georgian capital. You will hear the legendary story of Tbilisi, and will then walk the Old Town and its major highlights – Narikala fortress, Anchiskhati Basilica, Sulphur Baths district, etc. You will then visit the unique wine cellar located on a rooftop of a residential building: wine tasting and lunch. Afternoon visit the Museum of Georgian Ethnography – open air museum with ethnographic exponents (i.e. traditional houses, house-ware, etc.) presented from all over Georgia. After short refreshing rest at the Hotel visit traditional Georgian restaurant for dinner, accompanied by national dance and song show. After breakfast depart to Kakheti region following the picturesque Gombori mountain pass. 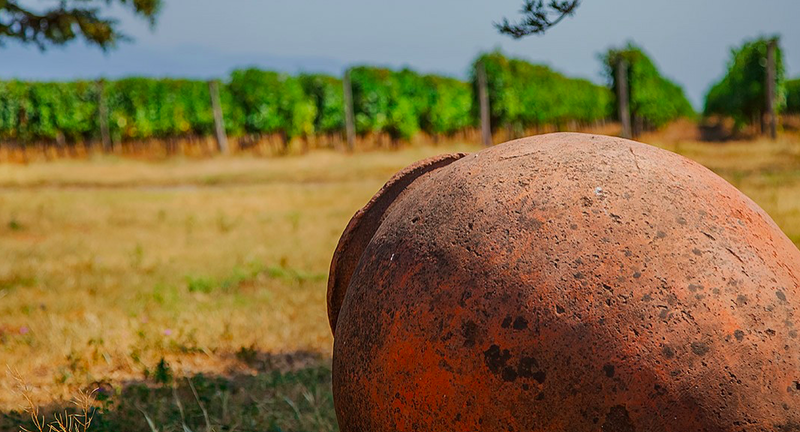 Village Vardisubani at the very heart of the Alazani valley is a home to one of the most famous qvevri-makers family in the country – you will see how the national wine vessel is made from the scratch. Next stop will be the Alaverdi monastery, the 6th century Orthodox monastery that is still in service, and as a matter of fact also known for its monastery wine. Next stop is one of the highlights of the day – “Wine Chateau Baba”, a vineyard, winery, and wine cellar located in arguably the most beautiful place in the region – the footsteps of Greater Caucasus mountain range. This family-run winery produces four types of traditional Georgian wine on 11 hectares of private vineyards: Saperavi, Kisi, Mtsvane and Rkatsiteli. You will have a detailed wine tour, followed by delicious lunch and wine tasting. Continue to Gremi architectural complex – 16th century Royal citadel of Kakhetian kings. Final stop of the day will be at Shaloshvili’s Marani and Hotel – private wine cellar: wine tour and dinner. Overnight. This day will be dedicated to Georgian wine locations outside of usual routes. The day will start with the visit to Jvari monastery right outside of Tbilisi. The monastery located on top of the hill overlooking Georgia’s ancient capital town Mtskheta. Continue to the Saguramo village to check-out the Guramishvili’s Marani winery: wine tour and wine tasting. Next stop will be an ordinary suburban Georgian house where a local family will welcome you for their traditional lunch served with home-made wine. Visit the old Mtskheta town afterwards, on the way back to Tbilisi.Free evening. Check-out from the Hotel before 12:00 pm. Tbilisi (4 nights) IOTA Hotel, Mercure Hotel, Ambassadori Hotel, Rooms Tbilisi Hotel, Riverside Hotel, etc. Tiflis Hotel, Betsy’s hotel, Old Kopala Hotel, Urban Boutique Hotel, etc.